Tip #1: Only use fireworks in open, flat, inflammable, and sturdy spaces. Some of this advice might seem obvious, but statistics prove otherwise. Fireworks start around 18,500 fires every year. If you’re going to set off legal fireworks, you need to make sure it’s done in a safe place. Scout out a location that’s hard and flat—like bare dirt, snow, concrete, sand, or stone—and avoid places with trees, grass, and buildings that could catch fire. Also consider the noise pollution. You’ll want to set off fireworks in a spot that won’t bother neighbors and their pets. Tip #2: Keep your distance. Fireworks that are available to the public are much smaller than those offered to professionals. However, they are still dangerous. If you have a ground-based firework like a fountain, then spectating from 25-40 yards away is recommended. For aerial fireworks, you’ll want to move everyone back about 75 yards. Tip #3: Gauge the weather. If it’s incredibly windy, postpone your fireworks show. Wind can push sparks into neighboring houses, buildings, trees, or grass and cause fires. Gusts may also endanger you and your guests if sparks fly toward you or fireworks tip over and launch in your direction. Use your best judgment. If it’s slightly windy, you can still have your show—just stand upwind and ensure nothing flammable is downwind. Tip #4: Keep water nearby. If you have a 10’ x 15’ tool shed that ignites and half of it is on fire, you’ll need 25 gallons of water per minute to put it out. That might be shocking, but it demonstrates what you’ll need to do to prepare for the worst. Tip #5: Light it, then get as far away as you can. Tragedies happen when people get too close to exploding fireworks. One of the more grizzly incidents happened in 2015 when a man was killed after using his head as a firework launch pad. Other accidental injuries have led to burns, lacerations, and loss of limbs. Considering that half of the 10,500 firework-related injuries in 2014, were burns to people’s’ faces, hands, arms, and legs, we know people are too close for comfort when it comes to fireworks. Do yourself a favor and stay far away! Tip #6: Light one firework at a time. Legal fuses have to burn for at least three seconds, but that’s not a very long time on its own. If you’re lighting multiple fuses, you’ll have even less of a window to escape. We mentioned that safe spectating distances for fireworks are anywhere from 25 to 100 yards, so you’ll need every second you can to get far away. Tip #7: Supervise your kids. In 2014, about 34% of firework-related injuries were suffered by kids younger than 15. These injuries ranged from minor burns to major contusions. What you may not realize is that something as small as a sparkler can do your children harm. Sparklers can burn at over 1,200 degrees Fahrenheit and cause third-degree burns. To put that in perspective, glass melts at 900 degrees. 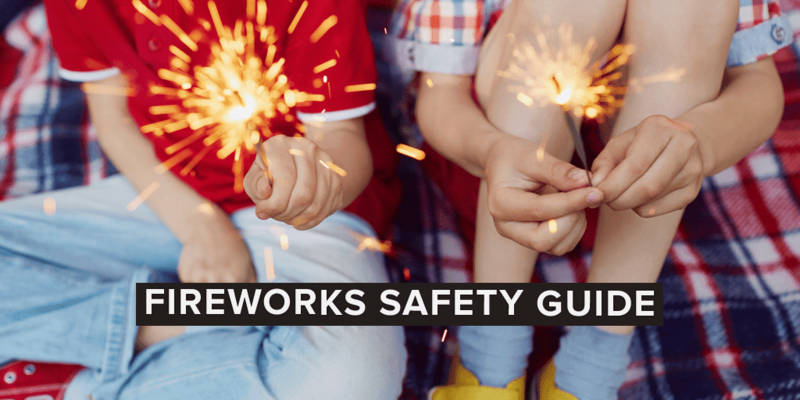 While they’re a fun staple for 4th of July picnics and other celebrations, make sure you’re around to supervise if your kids will be dancing around with these type of fireworks. Of course, keep them completely away from larger fireworks too. Sometimes fireworks don’t go off. The important thing to know here is that you should never try to relight or approaching one. Let these duds sit for five to 10 minutes before you put them in a bucket of water. This will prevent injury from a delayed explosion and disarm the firework permanently so you can dispose of it. Tip #9: Don’t throw used fireworks directly in the trash. When your fireworks or sparklers have successfully exploded into the sky, do not put them directly into the trash. Instead, soak the charred remains in a bucket of water. This will prevent used fireworks from igniting other garbage and creating a safety issue. Tip #10: Don’t buy illegal fireworks. Fireworks that are sold to the public are done so after rigorous safety checks by the U.S. Consumer Product Safety Commission (CPSC). Its rules forbid ground-based fireworks to have more than 50 mg of powder, aerial fireworks to have more than 130 mg of powder, fireworks to burn longer than nine seconds, and fuses to burn for less than three seconds. If you’re looking for fireworks, only buy them from licensed dealers and choose models that are approved by the CPSC. Buying illegal fireworks doesn’t guarantee their functional safety. Plus, they’re often too big and powerful to be “safe” for general use. Purchasing illegal fireworks could also land you with a ticket, jail time, or serious injury. And if you think the cops or neighbors won’t notice, it’s kind of hard to disguise a “boom” that big. Tip #11: Check your local laws. Not every state allows fireworks. Some restrict use to simple things like sparklers and firecrackers. Crossing state lines to bring them back to your home is also illegal. You can only set off fireworks that are approved by a state within that state’s lines. If you’re not sure about your state’s firework laws, here’s a resource you can use to find answers. Tip #12: Don’t play with fireworks if you’re under the influence. Lighting off an explosive when you don’t have your wits about you is so dangerous. When you drink, you lose the ability to judge situations wisely. Your reaction time slows down and your coordination lessens. Don’t put yourself in a position where you could endanger yourself or others. If you plan on drinking, don’t light off fireworks—simple as that. Tip #13: Leave it to the professionals. If you can, attend a professional firework show instead of putting one on yourself. These shows use impressive pyrotechnics that you can’t buy in stores and are sure to be better than your own show. Professionals also know exactly what needs to happen to keep people safe and you won’t ever have to worry about sitting too close or being burned. No matter what you decide to do, know the basics of firework safety. That way, nothing will get in the way of celebrating and you and your guests can remain safe. Also consider fire safety inside your home, and make sure you have a working smoke alarm. If you have your own tips about firework safety, please share with us in the comments section below.